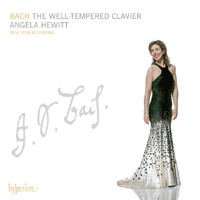 Ten years ago Angela Hewitt recorded a version of The Well-Tempered Clavier Book I which dazzled the critical world and record-buying public. It was followed shortly afterwards by Book II which was similarly received. Now, fresh from her Bach World Tour—in which she performed the complete Well-Tempered Clavier from August 2007 until the end of October 2008 in 58 cities in 21 countries on six continents—Angela has made an entirely new recording of this monumental work. Hear the differences for yourself! In a revealing and personal programme note (see below) Angela explains her reasons, both artistic and emotional, for this momentous creative decision to re-record the Well-Tempered Clavier. She speaks of the ‘new-found freedom’ that she discovered in her later performances, and especially her use of Fazioli pianos, ‘whose luminous, powerful, and also ever so delicate sounds opened new worlds to me and allowed my imagination to take flight’. Beautifully recorded in Berlin’s Jesus-Christus-Kirche, this is an unmissable new release. When I first recorded Bach’s Well-Tempered Clavier for Hyperion Records a decade ago (1997–9) it was an important milestone in my life. My cycle of Bach recordings was well under way, already with the Inventions, Sinfonias, French Suites and Partitas available. Although I had of course worked on many of the 48 preludes and fugues as a student, a lot of them were still fairly new to me. I recorded them from memory in four different sessions spread over two years. Soon after that, in the 1999–2000 concert season, I performed the complete cycle for the first time in a handful of venues in Canada, the United States, and the United Kingdom. Then I let it go while I recorded the remaining keyboard works of Bach, an undertaking which took me until 2005. In the autumn of that year I performed Book I again in concert, adding Book II in instalments during the first part of 2007. By then my idea of a Bach World Tour was coming to fruition, and from August 2007 until the end of October 2008 I performed the complete Well-Tempered Clavier in 58 cities in 21 countries on six continents. It was the experience of a lifetime, not just for me but for many of my audience whose warm appreciation and gratitude kept me going. To celebrate the tour, Hyperion re-released that initial recording as a specially priced boxed set (CDS44291/4). So you can imagine the surprise in the voice of Hyperion’s manager, Simon Perry, when I told him I wanted to record it again. ‘But why? It won so many accolades! How can I possibly sell another recording of it?’ I assured him that I played this music quite differently now, and since I was about to give so many performances, surely it would be the ideal time to have a new top-notch audio document of it. At first he agreed only if it were a ‘live’ recording, but that proved impossible to organize for various logistical reasons. In the end, I was delighted when he said I could go ahead with a studio session, this time in the renowned acoustic of the Jesus-Christus-Kirche in Berlin, and using my own Fazioli concert grand piano. What is it that makes this recording different from the first? Why was I so hell-bent on recording it again? The differences are not so easy to explain, rather they have to be heard and felt, but I will try. In the days preceding the studio sessions in September 2008, I decided that it would probably be a good thing to listen to the initial recording (I hadn’t for quite a while). I jotted down my thoughts as each prelude and fugue came and went. For several of them I made a special note to make sure they would be as good the second time round! But for others, the same words kept appearing. ‘Too straight’, I wrote, or ‘too square’. In the column reserved for my thoughts about how I play them now I wrote things such as ‘more colour’, ‘more expressive’, ‘more elastic’, ‘lighter’. Each listener will have his own opinion, but for sure listening to both recordings is a good test of musical perception. So where does this new-found freedom come from? And is it something that Bach would have approved of? First of all, I think it is important to say that it is not something I did consciously. It developed over time and was brought on by many things: my exposure to the French harpsichord repertoire (Rameau and Couperin) in which rhythmic freedom is a necessity; my switch to Fazioli pianos whose luminous, powerful, and also ever so delicate sounds opened new worlds to me and allowed my imagination to take flight; my continued work on the Bach keyboard repertoire during which I never stopped learning; working with other like-minded musicians; listening to others who played Bach so straight that I wanted to scream; and, perhaps most of all, ten more years of life and all the emotions that come with it—a greater sense of joy and sorrow and ability to translate them into music. Total freedom is possible only when a piece becomes part of you. During my Bach World Tour I had ample time to completely internalize this music, and I’m glad that this new recording was made after so many performances. Much of it has little editing (the B minor Fugue, No 24, from Book I is a complete performance—the first and only one I did in the sessions), and I hope that it recaptures what I tried to project in my live performances. The Well-Tempered Clavier is not only 48 individual pieces (96 if you count both books), but rather an extraordinarily complete whole, put together by one of the greatest minds and hearts that ever existed. Bach’s son, C P E Bach, in his treatise about playing keyboard instruments, remarked that ‘certain purposeful violations of the beat are often exceptionally beautiful’. The idea that Baroque music has to be metronomic is a false one. Of course the rhythmic pulse must be forever present, and you must never pull the music about just for the sake of it. Any rubato must be applied to illuminate something in the structure, to bring our attention to a beautiful change of harmony, to point out something to the listener that otherwise would be passed over too abruptly. In that way, structure, poetry and sound are all related and come together as a whole. A funny thing happened when I performed the complete cycle in Portland, Oregon, during my tour: a piano teacher was overheard remarking on how different my ‘new’ performance was from the older recording, and although she admired it hugely, thought that it might be ‘safer’ for her students to listen to the first version. I can understand the thinking behind that: it is risky putting ‘expression’ in Bach. But I prefer the risks, and I think Bach himself would have played it anything but safe!